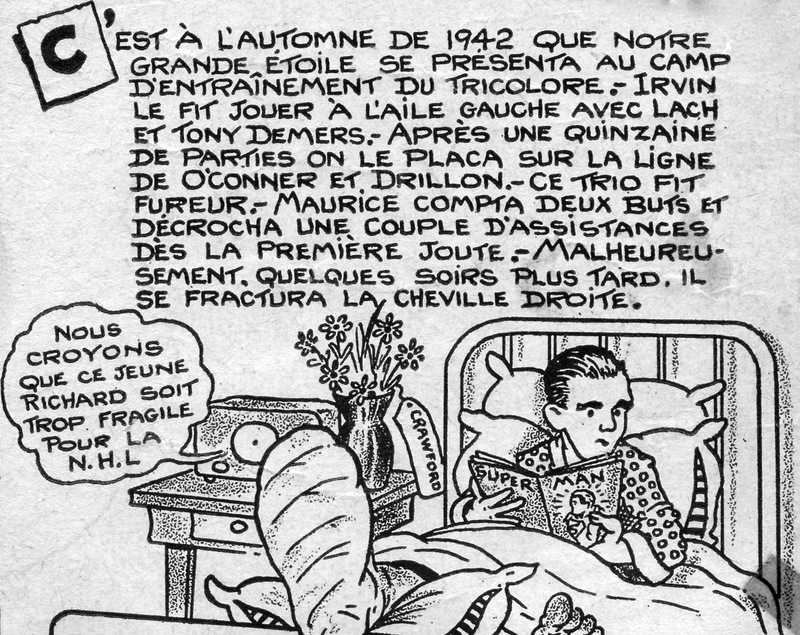 This was the second ankle-break of Maurice Richard’s fledgling career: in 1940, as a 19-year-old, he lower-body-injured himself playing in a game for Montreal’s Quebec Senior league farm team. He returned from that in 1941 … only to suffer a wrist fracture. He was sufficiently mended in 1942 to make the big-league Canadiens before he broke himself again. 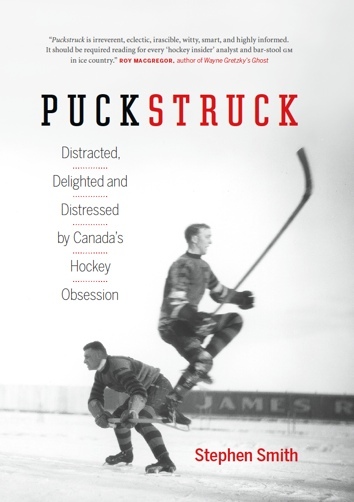 Richard himself got the timing of this 1942 incident slightly wrong: it happened during Montreal’s late-December game home to the Boston Bruins rather than in an away game earlier in the month, as he told it in the 1971 autobiography he wrote with Stan Fischler’s help. The next thing I knew, big Johnny Crawford, the Bruins’ defenceman who always wore a helmet, was looming directly in front of me. He smashed me with a terrific but fair body check and fell on top of me on the ice. As I fell, my leg twisted under my body and my ankle turned in the process. The awful pattern was virtually the same as it had been the year before, and the year before that! I was out of action for the entire season and missed the Stanley Cup playoffs, too. The puck is swept into Canadiens territory. Maurice grabs it. He’s out of breath. For a moment, he takes shelter behind the net. With his black gaze he analyzes the positions of his opponents and teammates, then lowers his head like a bull about to charge. With the first thrust of his skates the crowd is on its feet. It follows him, watches him move around obstacles, smash them. The fans begin to applaud the inevitable goal. He still has to outsmart Jack Crawford, a defenceman with shoulders “as wide as that.” He’s wearing his famous leather helmet. Here comes Maurice. The defenceman is getting closer, massive as a tank. The crowd holds its breath. Collision! The thud as two bodies collide. Maurice falls to the ice. And the heavy Crawford comes crashing down on him. Maurice lands on his own bent leg. When Crawford collapses on him he hears the familiar sound of breaking bone: his ankle. He grimaces. This young French Canadian will never be another Howie Morenz.